On the surface, recycling seems simple and clear. It's easy to assume glass, paper, aluminum and plastic bottles can all be recycled, and for the most part that is true. Things get a little fuzzy when you discover some glass and paper, and lots of plastic, can't be recycled. Recycling regulations vary depending on where you live and what kind of facilities are in your community. Luckily, general rules apply about products that cannot be recycled no matter where you live. While most latex paints are remade into new latex paint, check with your local recycling authority to see if this is offered in your community. Old paint often contains lead or mercury and cannot be recycled. The same goes for oil and acrylic paints used for arts and crafts. Painted building materials or wood fencing can't be recycled. A common trade name for polystyrene, a petroleum based product, is Styrofoam. Products made from polystyrene are numerous and none of them can be recycled. These include packing materials, ice coolers and food containers. Alkaline batteries contain small amounts of mercury. The Washington State Department of Ecology points out that batteries turned in for recycling are often treated as hazardous waste. Nickel-cadmium rechargeable batteries in common sizes like AA are recycled, but not all rechargeable batteries can be recycled. Most cell phone batteries cannot be recycled. Coated paper products generally cannot be recycled. 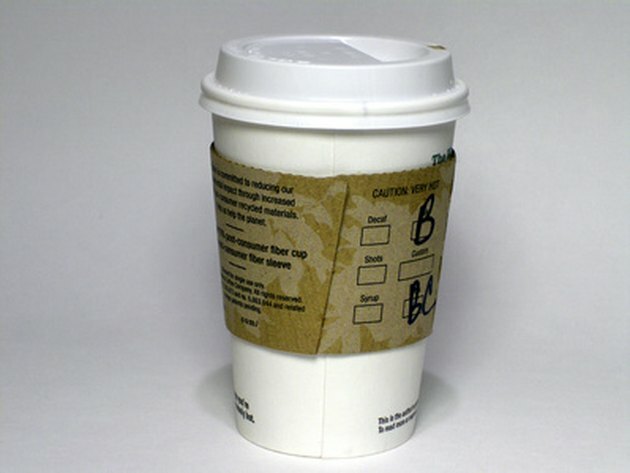 For example, paper coffee cups are lined with polyethylene, which acts as an insulator. Polyethylene can't be recycled. Milk cartons and juice boxes can't be recycled because other non-recyclable materials are mixed in with the paper. Any cardboard or paper products that have grease or food remnants cannot be recycled, such as pizza boxes and take out cartons. Glass bottles and jars can be recycled, but only if they are whole and do not have significant damage. Broken glass cannot be recycled because it is hard to tell what the source of the glass is when it's broken. The glass mixture used for bottles is different than that used for jars, according to Washington State Department of Ecology, and the two can't be mixed. Window panes and mirrors also can't be recycled. Generally, only plastic bottles and jugs with the numbers 1 or 2 on the bottom can be recycled. Plastic products made from polyvinyl chloride, such as shower curtains, piping, window frames and some toys, can't be recycled. Don't put the lids of recyclable water bottles in your recycling bin, and plastic bags cannot be recycled. Styromelt: How is Polystyrene (styrofoam) made? What Items Can't Be Recycled?